It’s almost disappointing when the National Theatre turns out something that isn’t a complete turkey. It’s really much more fun to put the boot in to the venerable grey building than it is to celebrate an excellent ensemble piece with superb staging and first-rate technicals. Unfortunately, The White Guard is very good. The story follows a family’s fortunes as they navigate their way through the Russian civil war, first as protagonists and finally as survivors. The central question raised is the value of fighting for noble but defeated ideals. The White Guard of the title is an Ukrainian (or, in their views, Russian) military unit fighting first the Ukrainian nationalists and then the Bolsheviks, desperately searching for a cause despite the abandonment of everything to which they attempt to attach themselves. This is an ensemble piece in the truest sense of the word, meaning not that nobody is too strong to stand out but that nobody is weak enough to allow any weak spots to emerge. Daniel Flynn exudes authority and integrity. Paul Higgins overflows with passion and anger. Pip Carter – who it would be unfair to dismiss as the poor man’s Benedict Cumberbatch – is finally allowed to play on the grown ups stage after his apprenticeship in the Cottesloe and surprises by playing entirely against type (polite, malevolent, vaguely murderous) as the poetic Larion. 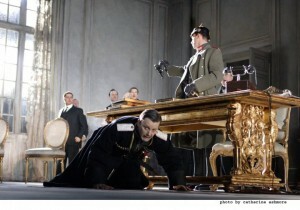 Conleith Hill is compelling as the appeasist regal aide-de-camp come prole opera singer Shervinsky. Most worthy of comment, however, is Justine Mitchell who steals every scene she has as Lena, the beautiful, cursed and charming matriarch. She is compelling in her maternal and sororal affection for Larion and brings a sense of dignity to even her infidelity. It would be, unfair, however, to lavish too much praise on any individual. Impressive as Ms Mitchell is, the real star of this show is the ensemble. And if it’s not the ensemble, then it’s the set. Which is amazing. Whether it’s fading off into the distance, appearing from the floor, dropping from the ceiling or exploding into hundreds of pieces, the set and the design is truly amazing. No projectors here. You really see your money up there in front of you – more often than not bursting into flames. Legally Blonde went so far as to say that she thought it three dimensional. And if that’s not high praise, I don’t know what is. The White Guard is exactly why we have a national theatre. Obscure story. No stars. Great ensemble cast. And it must have cost a fortune. Hi SansTaste. Would love you to become one of the UTWE editors (unpaid natch). Could you get in touch? All the best, Roo.